My latest column at Perfect Sound Forever is up at http://www.furious.com/perfect/vinyl80.html. Against my better judgment, I have once again taken on the Technics 1200 in a piece called "Of Lipstick and Pigs." If you're like me, you love the look of cartridges. Even the ones that are basically cubes (i.e. 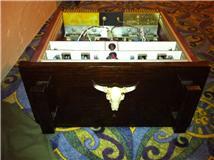 Koetsus or even my Zu Audio DL-103) can be made beautiful through the use of exotic materials. But this cartridge from Ortofon, the MC A90, is extremely unique in appearance and will undoubtedly be a big hit with audiophiles who don't like to run with the pack. The A90 is $4200, which isn't chump change, but it is an attempt to further the state of the art. Released to celebrate the 90th anniversary of Ortofon, this cartridge employs a Selective Laser Melting (SLM) technique to reduce resonances in the body. 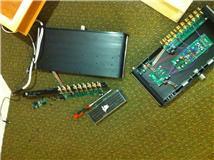 Everything is built into the one-piece body including the magnet assembly, the terminal block and the wire guard. Unfortunately, the A90 is limited to a production run of 400, and it's already out of production. 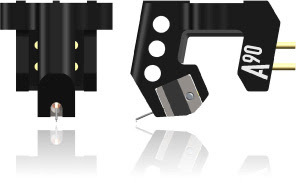 But the technologies used in the A90 will probably appear in future Ortofon models. 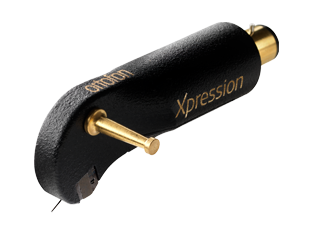 I've been a fan of Ortofon ever since I strapped an X5-MC onto my AR ES-1 back in the late '80s and experienced high-end analog playback for the first time. I've heard plenty of Ortofons since then, and not one has been anything less than excellent (except for maybe the OM-5e they put on the cheaper Regas, which is still decent for its low price). I'm looking forward to hearing the A90 as soon as possible. 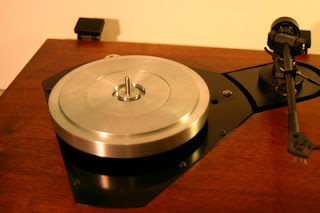 David Archambault at Vinyl Nirvana is offering yet another heavily modded AR ES-1 turntable at his site (www.vinylnirvana.com). 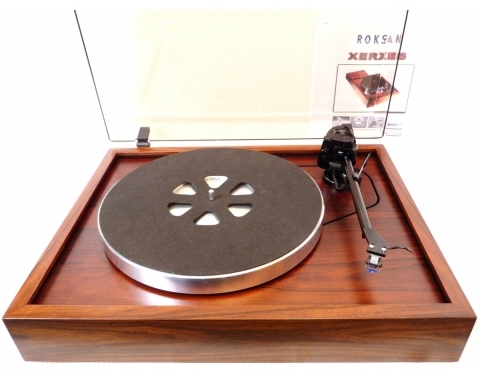 This one has been modded by Steve Frosten, a gentleman who works with Dave to restore many of these vintage Thorens and AR 'tables. This one has been fitted with a Linn Basik Plus arm. I've never heard this combination before, but I have a lot of respect for Linn and I have a feeling this is one special TT. 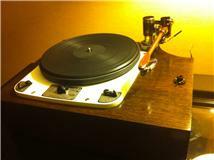 "I am delighted to offer this turntable on Vinyl Nirvana on “consignment” for Steve Frosten. Steve and I have been collaborating on various AR projects for years, and he does first quality work. More than that, he adheres to the same philosophy as me: he’s not happy unless you are happy. 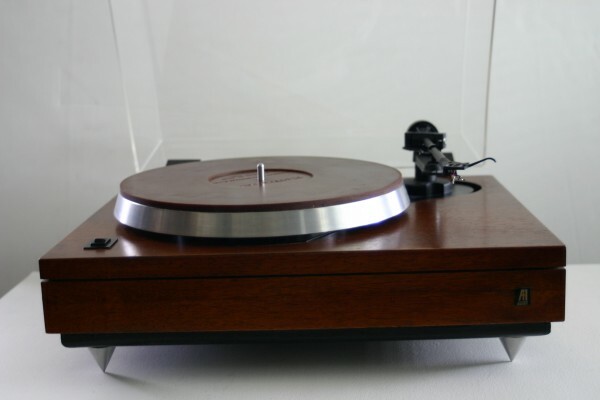 On to his turntable…cosmetically, this table is an 8.o on a scale of 1-10. The walnut veneer has been refinished and is in excellent shape. The metal portion of the plinth is refinished state as well. There is a dustcover in almost new condition, but for one minute scratch. 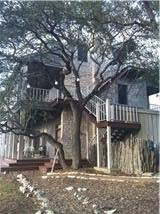 All I know is it’s gorgeous and I am pleased to have it offered here. If interested in purchasing, email Steve. sjf111454@gmail.com." These pics show the extent of Steve's mods. When I owned an AR turntable, the first mods I attempted involved flipping this table over and trying to improve the vibration control inside the base. If you have a stock AR ES-1, the first thing you'll notice is the cheap piece of MDF that is screwed to the bottom, obscuring the innards. I immediately removed this and noticed a huge difference in the quality of the sound; it was quieter and the silence between the notes was darker and more liquid-sounding. Steve has obviously taken this several steps further. Both the arm and table are available for $1249. Just choose a great cartridge (anything but a Grado, which will hum) and you'll have an analog rig that will be very competitive with the likes of Rega, Pro-Ject and other more modern TTs. 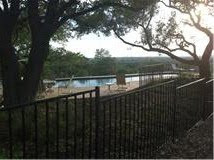 Plus, it's beautiful! "I'm getting a lot of Linn Sondek LP12s in for trade lately," Gene Rubin once told me many years ago. I had just finished telling him how much I wanted to audition a Linn and hear what this legendary TT sounded like. I was also incredulous that people would trade these in--wasn't the Linn the best-sounding turntable ever made (a sentiment that had quite a lot of support back in the '90s)? "What are they trading them in on?" I asked, slightly astounded. "The Roksan Xerxes, of course." Back when I first met Gene, probably 1991 or so, he basically sold two brands of turntables--Rega and Roksan. (Now he sells quite a few including Clearaudio, J. A. Michell and VPI). His reference rig was the original Roksan TT, a Naim ARO arm and an Audio-Technica OC9 cartridge. I heard this combo many times, and if I could afford the approximately $4400 back then, I would have splurged. I wound up getting a Rega P3. Later, I traded it in on a Rega P25, then a J.A. Michell Orbe SE. But I always had a lot of respect for the first Roksan Xerxes. Well, Echo Audio in Portland currently has a beautiful rosewood veneered Roksan fitted with a classic Zeta arm and a Shure M97 cartridge. (I'd ditch the Shure for something more worthy of the Roksan.) He's selling this combo for just $825. This is a great 'table for less than a grand. Echo isn't offering shipping on this item, so some lucky Portland audiophile will probably wind up with this gorgeous analog rig. 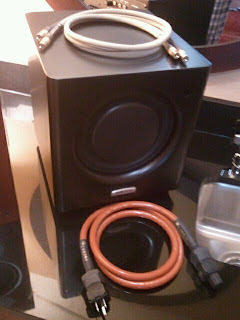 To see the Roksan, just check out Echo Audio at http://echohifi.com/just_arrived.php. Here's a novel idea. Have a boy and girl duo start a rock band. It's only the two of them, just drums and guitar. They have the same last name, but it's unclear whether or not they're married, brother and sister or just a happy coincidence. On their website, they are holding hands. Hmmm. 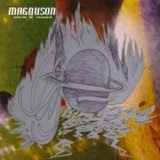 Once you start listening to Magnuson's new CD, however, you stop comparing Greg and Kyrsten Magnuson to that other couple. The Magnuson sound is turgid and dense like a muddy thicket, less Zep and more Sabbath. The prog element, varnished with a Moog that growls deep within the mix, ensures that the paths never cross. This is not a stripped-down sound, laid bare, simple for the sake of being simple. This is two point sources being stretched out to fill a void with energy and a fair share of grime. In addition, the couple sets out on a different path by taking turns on their instruments. That right...Greg plays guitar and Kyrsten plays drums on seven songs, and Kyrsten plays guitars and Greg plays drums on the other seven tracks. Much to my surprise I prefer the former arrangement; Greg tends to rely on rolling fills on his ground toms after nearly every measure while Kyrsten can both cross genres and lighten things up with her more varied rhythms. Both play their guitars almost as if they taught each other how to play. Perhaps they did. Billing themselves as "the most musical mayhem ever created by a girl and a boy," Magnuson doesn't quite devolve into such chaos. Working within a garage-band aesthetic, they retain conventional song structures as they touch on the aforementioned Sabbath (the opener, "Dark Reality"), power pop ("Somewhere"), modern metal ("The Scout"), and classic '80s New Wave ("Fear and Deception"). You won't hear anything quite as groundbreaking as De Stijl, but you will get heaping, muddy doses of energy, harmony and, well, ground toms. There's nothing wrong with that. See this man? 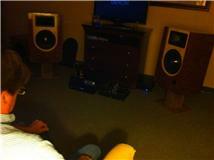 It's none other than Russ Gates of Polk Audio checking out the competition. 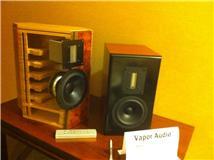 The competition, by the way, is Vapor Audio, and they featured a surprisingly good system based on their Cirrus Loudspeakers and Eastern Electric amplification and sources. Vapor had quite an unusual set up in their room; the system was set up along the front wall in front of the door, so you had to literally walk through the cables and the speakers to get to a listening chair. I'm sure they arrived at this solution after careful voicing, because this system rocked. While I was quite surprised with the weight and the power of these relatively small yet exquisitely shaped stand-mounted speakers, I shouldn't have been. The Cirrus starts at $3495 a pair, and each one weighs 53 pounds. 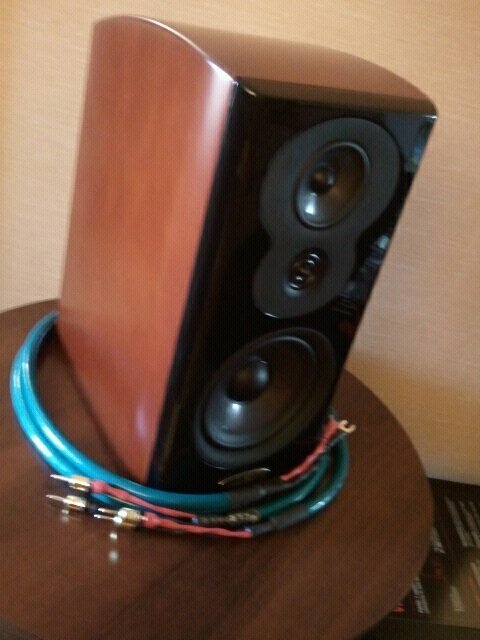 It's a well-built and well-designed loudspeaker. I think I assumed that just because I hadn't heard of Vapor, they were another product from a DIYer who was ready to throw his hat into the commercial audio ring. But this a mature product that's available in many exotic finishes and with many intriguing upgrades and options. Needless to say, they were more than dynamic enough to work with Tool and send me off into the Texas night with a big smile on my face. 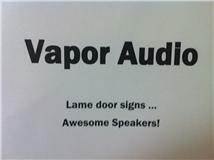 For more about Vapor Audio, check out their website at http://www.vaporsound.com/. These neat little single-driver speakers are from Bob Brines of Brines Acoustics. Bob uses a variety of full-range drivers from Fostex, Lowther, Tang Band and Mark Audio to create a full line of speakers sound at affordable prices. The entry level transmission line T7-A7s, with their tiny Alpair 7 drivers, run for just $695 a pair. 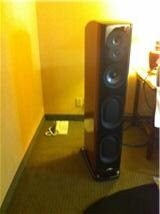 The more ambitious floorstanding LT2000s, complete with Lowther DX3s, runs for $2495. 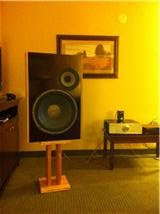 The speakers pictured here are the TB-20s, a bass reflex design with uses the Tang Band W8-1772 driver, cost a mere $1095 a pair (a floorstanding version is $1995). 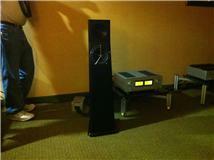 The sound was smooth and full and performed well with a number of classical music selections. The cabinets were a little beat up (this must have been his show pair), but the overall cosmetics were very attractive. 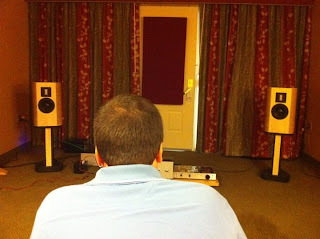 You can see more at Bob's website at www.brinesacoustics.com. 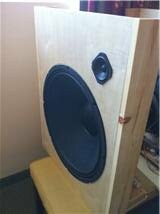 These unusually large "stand-mounted" speakers are from Manzanita Audio Solutions and use a simple and retro approach to create big sound for a modest price. All three of the models offered by MAS are open baffle designs and are designed to be powered by modest, unassuming amplification. Based around such drivers as a 12" treated paper cone woofer and a 3.5" paper mid/tweeter (both with Faraday rings), the Manzanitas can hit 37 Hz and throw up a wide, detailed soundstage. While two of the models only offer 82.5 dB sensitivity, MAS says they can be powered with as little as 25 watts per channel. A High Efficiency model, pictured at the top, offers a 97 dB efficiency that's a perfect match for SETs. While the frames around the edges may look unfinished in the pictures, the Manzanita baffles are actually constructed with nine layers of New Zealand Radiata knot-free Pine and shaped by a CNC. They, as well as the rest of the cabinets, can be sanded and stained to order. Best of all, the Manzanitas start at just $987 a pair (the High Efficiency model runs $2750 a pair) and have a full one-year warranty. While I think I would prefer to see a floorstanding model--the big Manzanitas on those skinny bases looked very top-heavy--I was very impressed with the overall sound. 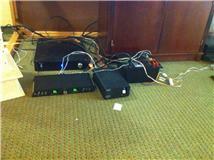 You can contact MAS at 830-895-0594 or email them at jdbusch@windstream.net. 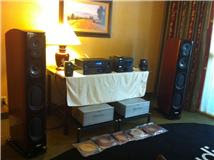 I'll have some more coverage from the Lone Star Audio Fest 2011 in the next few days. I'm buried with work right now, but I promise there's more fun stuff to come! I just stumbled onto this cool blog called the Czars of 45, which is run by a couple of guys named Nathan and Kent. I actually know Kent, aka Kent Teffeteller, from my days hanging out on the Steve Hoffman forum. At first I thought these guys might be into 45 output tubes (which I love dearly from days owning a Yamamoto Sound Craft amplifier), but it turns out these two collect 45rpm records. Very, very cool. You can check out this blog at http://www.theczarsof45.blogspot.com/. I really hate to hand out "Best Sound at Show" Awards, especially since the sound in the Polk Audio room was also utterly fantastic, but it was difficult to ignore the sound coming from the Advanced Home Theater Systems room at the Lone Star Audio Fest. For the most part the system was simple: a Luxman L-590A Pure Class A integrated amp and D-05 CD/SACD player fed into YG Acoustic Carmel speakers and wired with MIT cables. If you've read my AXPONA and CES reports, you'll recognize YG as the company who has touted themselves as making the best speakers in the world. Hyperbole aside, they're starting to convince me. 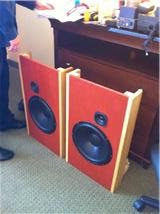 The Carmels are their new "entry-level" speakers. They are thin floorstanding two-ways that stand just a hair over 40 inches high. While their aluminum enclosures are flawlessly machined and their drivers obviously of the highest quality, I did balk at the fact that they cost $18,000 per pair. Then I listened. In my opinion, you get your money's worth. 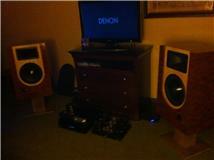 The Carmels were simply getting further into the music than any other speakers I've heard this size. Every musical selection sounded expansive, natural and deeply musical. The more I listened, the more I fell in love. Bass performance was staggering. According to the brochure, they have "usable output" at 35 Hz, but I felt they were going even deeper. I told someone there that if I had the money, I'd be writing a check. 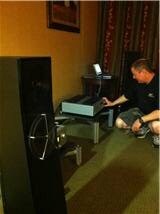 Scott Warren of Advanced Home Theater Systems was more than gracious in showing off this wonderful system. I gave him a copy of the Dean Peer Airborne CD and he went nuts. Even though the name of his Plano-based store seems to focus on home theater, he also carries stellar two-channel gear from the likes of DarTZeel, Von Schweikert and many others. 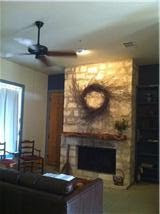 You can check out his website at www.advancedhometheater.com. One of my main reasons for attending the Lone Star Audio Fest was to meet my longtime Facebook friend Russ Gates, who works for Polk. 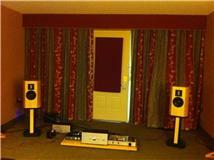 I've always enjoyed Polk speakers but wondered why they dropped off the high-end audio map over the last few years. Their amazing SDA speakers, which throw out a nearly 180 degree soundstage, were among my favorite speakers in the late '80s. Polk really seemed to employ a lot of research and development into their loudspeaker designs, but they suddenly switched their focus to home theater and car audio. They excel at both (my brother Greg owns a Polk-based surround system in his living room, and it has always impressed me), but I've missed their more ambitious speaker designs. 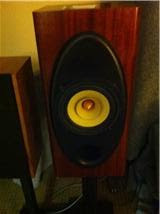 My concerns have been answered with their new flagship speaker, the LSiM707. This relatively tall floorstanding speaker is both gorgeous in appearance and impressive in performance, especially when mated with Jaton Operatta amplification and CD players, all hooked up with Cardas cable (Russ was the only exhibitor to use Cardas, which certainly gave him an edge in my opinion). Throughout the Lone Star Audio Fest I found myself wandering back to Russ' room to hear some truly nice sound. Toward the end of the show I gave Russ a CD copy of Dean Peer's Airborne and was taken with the LSiM707's ability to reproduce all of those splendid low frequencies. Russ, in turn, was equally impressed with Dean and made a comment about wishing he had had this CD for the entirety of the show. It's such great demo material. The LSiM707 will be part of an upcoming line of speakers that will include a smaller floorstander (called the LSiM705, I think) and a bookshelf version (the '703) that basically looks like the top half of the '707s with the same three drivers. Best of all, the '707s will retail for just $4000 a pair, which makes them very, very competitive at that price point. 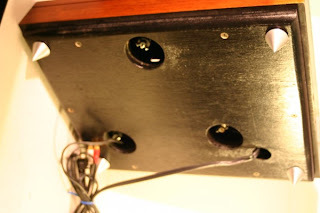 While seeing someone making a speaker enclosure out of cellos certainly seems odd at first glance, I'm surprised someone hasn't done it until now. These speaker systems from Audible Improvements (www.audibleimprovements.com) use a heavily modified Fostex driver and they sounded much better than I expected. Think about it: a string instrument such as a cello or a guitar is tuned and voiced very carefully in the same way as a speaker enclosure. 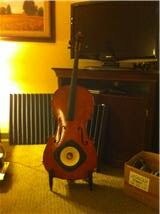 So the sound of these Merlot Cello speakers were colored but in a very musical way. 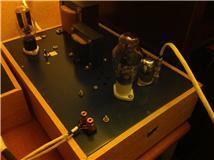 Paul also makes some very industrial-looking yet very cool tube amplifiers; his 6a3 300B-based amplifier runs $3000, and his 845-based Aurora Borealis amp is $4500. 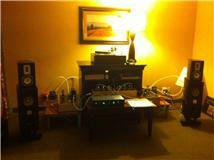 He also modifies Cambridge Audio 840cs and 640cvs for a reasonable price. The cost of the Merlot Cello speakers is a mere $3500 for pair, which isn't that much considering the cost of cellos these days. We listened to some Ella Fitzgerald and the sound was smooth, extended, sweet and immediate. The only downside was the low position of the drivers near the floor made the soundstage cling to the ground a bit. But other than that, the sound was life-like and compelling. 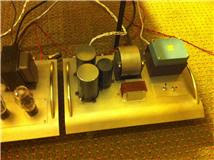 This big, heavy amp was sitting in one of the hallways at the Lone Star Audio fest. Again, there was no information on the chassis so I had no idea who made these. I just thought it looked really cool! These large, beautifully finished speakers were high-efficiency designs from Pi Speakers. While I wasn't in love with the musical selections (they concentrated on live recordings that seemed to have a somewhat muddy sound), these speakers excelled with dynamics and had plenty of weight on the low end. Using an older 10wpc Audio Note amplifier certainly didn't hurt! Here's something you won't see at CES...a completely unattended room. What's even more mysterious was that there was no signage on the room, so I had no info about the products. 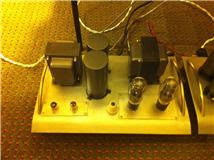 Amps were strewn all over the floor; some were taken apart and looked as if they were in the midst of being repaired. 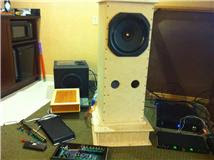 The room seemed to center around these DIY speakers that sported a huge single driver inside unfinished plywood enclosures. A lone computer monitor played FLAC files from a menu labeled "Very Audiophile Music." I stole a few York Peppermint patties from the dish on the table (because they were, after all, York Peppermint patties) and I listened and was actually impressed with the sound. These DIY speakers threw up a big soundstage, and imaging was excellent. 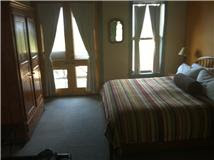 I went back later to get some information, and the room was still empty! I just returned from the Lone Star Audio Fest 2011 and had a great time. This is definitely one of the smaller audio trade shows out there, with the show only taking up a handful of rooms on the second and third floors of the Embassy Suites Dallas-Park Central. 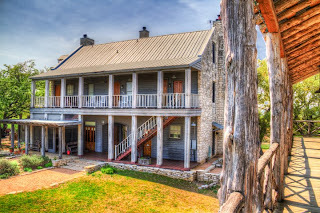 I enjoyed the spirit of the show with its emphasis on DIY and small local Texas audio manufacturers, but I still managed to hear a lot of good sound. In a couple of instances I heard truly great sound from a couple of noteworthy brands such as YG Acoustics, Audio Note and Polk. I did get a chance to spend a lot of time with this gorgeous Garrard 301 with a custom plinth. 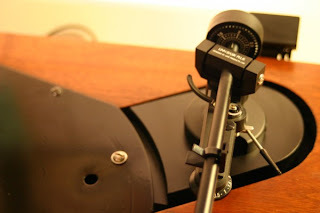 The tonearm is the Talea from Durand Tonearm; Joel-Francis Durand is a French composer who currently lives in Seattle. His tonearm spots a wand made from Bolivian Rosewood. He chose this wood after experimenting with a variety of woods and found this choice to be spot-on musically. The cartridge was an older Ortofon that still had a few miles left on it. The amps were made by Scott Sheaffer of Found Music (www.found-music.com) who was running the room. 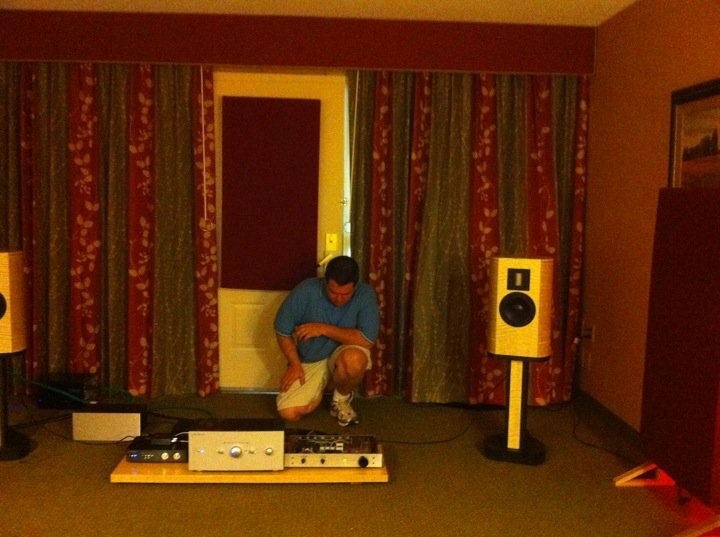 These amps only provide about a watt per channel, and Scott was brave enough to pair them with Von Schweikert speakers that only had average effeciency. The result was a sound that excelled at low volumes, but need a little more juice to really impress. 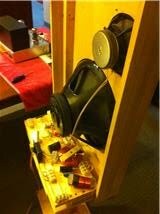 Scott's point was that you didn't necessarily need super-sensitive speakers to get great sound from "flea-powered" amplification, and from my own experience with SETs I know that you can still get great results as long as you listen to more intimate music at lower volumes in a relatively small room. But I'd love to hear these amps with something like a Zu Druid or a classic Klipsch. Still, I think Found Music is onto something here! There's a great article on the Acoustic Sounds website regarding Chad Kassem's new record pressing facility. 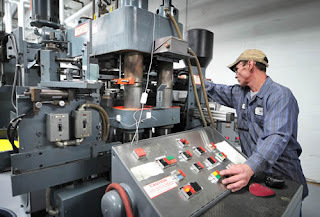 Written by David Clouston of the Salina Journal, the article even goes as far as to say: "Driving the market is an increasing demand for the superior quality of music that vinyl LPs provide over the more popular CDs." Outstanding, Chad! Good luck with the new venture! 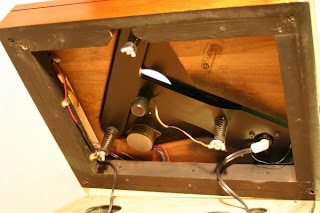 You can read the article at http://store.acousticsounds.com/index.cfm?get=page&PID=513. 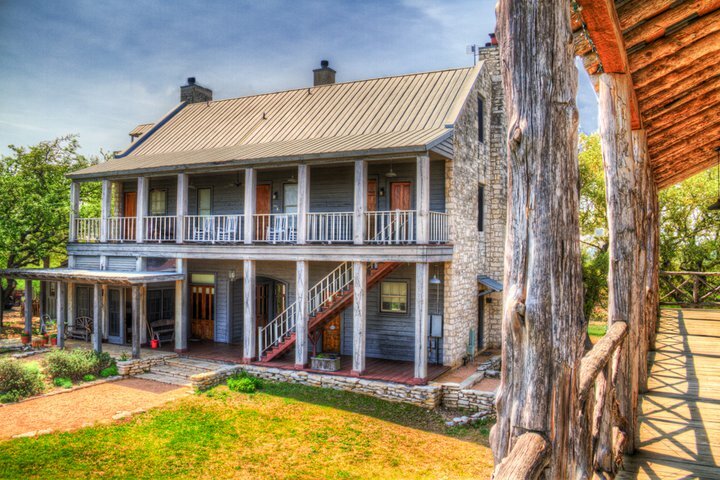 This weekend I'll be headed up to Dallas for the 2011 Lone Star Audio Fest. While this seems to be one of the smaller audio trade shows on my calendar, I'm looking forward to it because a) Dallas seems to be a hotbed of high-end audio dealers and audiophiles, b) I won't have to hop on another plane to attend and c) I get to meet my friend Russ Gates of Polk Audio for the first time face-to-face. The Lone Star Audio Fest will run from May 13th to May 15th and will be held at the Embassy Suites Dallas - Park Central. For more information on exhibitors, check out the website at http://lonestaraudiofest.com/. I hope to see you there! Alan Shepard once said that as he was waiting to be the first American in space, all he could think was that “every part of this ship was built by the low bidder.” As I ponder the Fleet Foxes’ new album, Helplessness Blues, I can’t help think about such compromises when it comes to the business of reviewing music on a professional level. I bring this up because I was placed under similar pressure when I reviewed the first Fleet Foxes album for a certain publication. I had to finish a review quickly in order to meet a deadline, and I only had a chance to listen to this album—one that gradually evolved into a personal favorite for the 21st century— a couple of times. I did get a handle on the timelessness of the Fleet Foxes’ sound, but it didn’t dawn on me that this was actually folk music until a few more listens—the rich harmonies had only reminded me of the Beach Boys up to that point and I actually included that superficial comment in a review that had already been sent. When I saw the published and edited review in the magazine, I wished I could take it back. It seemed almost as if someone else had written it. Such are the hazards of professional music reviews. 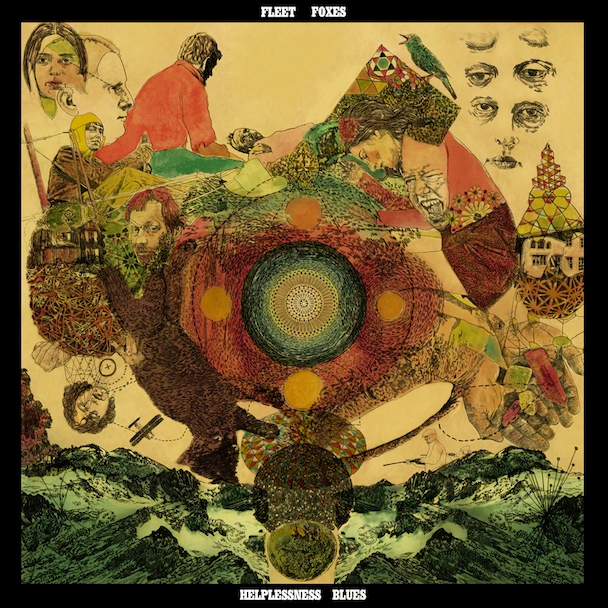 1.If you love the first Fleet Foxes album, you will probably love this one. It is cut from the same cloth and is an excellent companion piece. The songs are softer and more ambitious (the string arrangements, for example, are an exciting addition), but you will never make the mistake that these songs are coming from anyone other than FF. 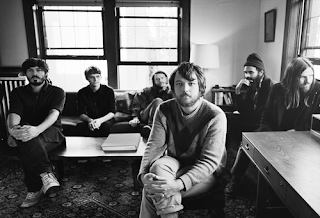 2.Robin Pecknold emerges as more of a frontman than ever before. His clear, strong and nearly perfect voice doesn’t reside as deeply in the harmonies as in the first album. I saw the Fleet Foxes perform a couple of years ago at the Moore Theater in Seattle (probably the best concert I’ve seen in the last ten years), and I watched this man sing to a crowd of a couple thousand acapella and without amplification and he sent chills down my spine. He is, to use a cliché, the real deal. 3.This new album makes me smile more than any other album I’ve heard in quite a while. These involuntary responses of joy usually come when the song suddenly shifts gears and takes enormous risks in terms of instrumentation and song structure. The Fleet Foxes may be mining a particularly classic musical genre, but they do it in a way that is fresh, adventurous and unique. 4.“Bedouin Dress,” with its almost jazzy fiddle touches, may be the most surprising song they’ve ever done and suggests a multitude of new directions. 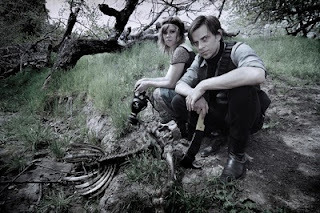 Conversely, “Battery Kinzie” is the most ordinary song they’ve yet recorded. The last couple of minutes of “The Shrine/An Argument” are so atonal that you’ll wonder if you wandered into a different album entirely. 5.I would trade a little of their trademark serenity for a modicum of wild abandon. I find myself wishing that they’d open up and rock a little more. But that may be missing the point. So this rumination on music reviewing begs the question of whether or not I—and every other self-proclaimed music critic out there—should attempt a follow-up review on this rich, complex and somewhat elusive album a few weeks down the line. As a mere blogger I certainly have that luxury, but those getting paid to write about Helplessness Blues should be facing a conundrum. Ten years from now I think you may see a lot more written about the enduring achievements this Seattle band has offered the world, but for now we only have fleeting (pun intended) and hurried impressions from hired guns. Is it enough to prompt you to buy this album? Will it be your thing? Will you love it as much as I do? I won’t even attempt to postulate. I will offer one final comment. Someone has already asked me if I got this on vinyl. As of this writing, it’s not yet available. I do know that the first album was available on LP a few months after the CD was released, and I had a chance to compare the sound quality of both. It was almost identical. In fact, it was probably one of the rare times I preferred the sound of the CD to the LP, which meant that the former was probably cut from the same master. So play hooky from work and either get this into your CD player or download it into your computer now rather than later. Ten years from now, you may thank me for giving you the additional time to ponder the ultimate value of Helplessness Blues. The big audio news out of the UK this week is Rega's new version of its entry-level Brio, named the Brio R. (The R is for "remote," a welcome addition to an already great product). As you can see, the styling is taken from its very successful DAC, which came out earlier in the year. I've heard the DAC a couple of times, and I think it's probably one of the finest DACs out there for about a grand. The new Brio R will retail for $895. For your extra $200 you get the aforementioned remote, which alone justifies the price increase in my opinion. 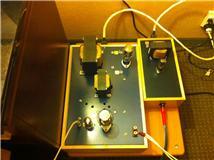 You also get improvements in the low and high current power supplies, the coupling and the bypass capacitors. You even get an improved phono stage which has been revised to "reflect improvements in current Rega Planar turntables." The input sensitivity has been increased, in other words. Advanced word is that the Rega Brio R is a stunner and will continue to lead the field when it comes to sub-$1000 solid state integrated amplifiers. I look forward to hearing one soon. 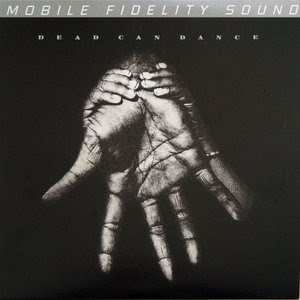 Dead Can Dance's Into the Labyrinth has always been one of my desert island discs, so I was excited to hear about the Mobile Fidelity Sound Lab's version that was released earlier this year. Despite the fact that the only copy I've ever owned was a promo CD that was basically contained in an empty jewel case--I didn't even know what the cover looked like until I had owned it for a couple of years--it is easily one of the finest-sounding CDs I own and was always one of the reference discs I've used to evaluate new equipment. After hearing Michael Fremer rave about the MFSL release in a recent copy of Stereophile, I knew I had to have it. I had a chance to listen to a 180 gram pressing of Into the Labyrinth a few years ago and came away thinking that it sounded no better than my promo CD. In most cases, that means the CD and the LP were both sourced from the same digital masters, so I resisted getting the vinyl version. I'm glad I waited for this. First of all, it's a little disconcerting to hear a record I've heard at least one hundred times sound so different. The MoFi remaster is anything but a subtle improvement. Everything sounds bigger and deeper. Percussion, in particular, sounds more fleshed out and textured. The big, soft gong that is struck periodically through "Yulunga," the opening cut, had enormous bloom and decay--more than any other time I've ever heard this cut (and that includes some expensive gear featuring BIG speakers). And when the vocals--which were recorded in a large church--kick in, you can clearly hear the echoes bouncing off the walls. Needless to say, I won't have a need to listen to my well-worn CD ever again. It won't be the same. I noticed a bit of surface noise throughout the record when I first played it, but one treatment of the Walker Audio Prelude record cleaning system fixed this problem. So if you do splurge and spend the $35.99 on this 2-LP set, make sure you give the discs a good cleaning before you sit down and listen.